Dyp deg inn i Philadelphia historie med denne kombinasjonsturen, som inkluderer en hop-on hop-off bussbillett, opptak til Eastern State Penitentiary, og en historisk spasertur. Hopp av busstur på en av de 27 attraksjonene for å utforske videre på egen hånd. Se Al Capones celle og lær om historien om amerikansk fengsling i Øststaten. Følg i statsmannen Benjamin Franklins trinn på en historisk spasertur i Old Citys høydepunkter. One of the best historical tours we have done to date. Our guide was an absolute pleasure to listen to and it's quite clear he knows his city. Had a great experience. The HOHO bus took us to all the historic places. We spent a lot of time at the Eastern State Penitentiary. Unfortunately, time did not permit us to take the Franklin's Footsteps walking tour. The Penitentiary was extremely interesting and informative. We all had a great day and loved the tour. I am a native Californian and my husband and I live there. We were visiting my husband's sister and husband. 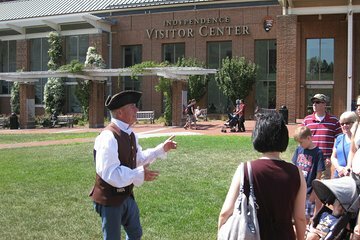 They, being native Pennsylvanians, had never been to Philadelphia to see the American history places. They were all very impressed with the tour. We had a wonderful time! The bus tour was so informative. They make frequent stops and let you know what each stop is like. We did not get a chance to do Franklin's Footsteps, but plan on going back for the tour. The Eastern State Penitentiary was fantastic. You take a guided audio tour so you can take your time.